Over the last few weeks it’s become apparent to me that, despite being a public service broadcaster paid for by taxpayers like myself, that the BBC is sadly blinkered and censored by the pro-Israeli powers (Israel, the US for starters) that loom over the current conflict. I’ve been a devoted follower of the BBC since I was old enough to watch tv or listen to the radio. I’ve defended it on numerous occasions when people have complained about the fee, the programming, the coverage, digital channels…. but watching the news coverage of the last few weeks has depressed me. This is a conflict with two sides, yet there seems to be an almost total absence of detail for the Palestinians, especially on tv. This morning for BBC Breakfast, the headlines were about the 3 Israeli soldiers killed by their own troops, and about Israeli statements on ceasefires, and the ‘terror’ they seek to extinguish with their attacks. Only on the scrolling headlines below were there mentions of the number of Palestinians killed, with no mention by the newcasters themselves of the total killed, which at over 500 dwarfs the handful of Israelis. This 500 includes civilians – women and children – but it is almost as if everyone in Palenstine is a fair target from their association (or not) with Hamas. And the BBC is happy to broadcast the continuing rhetoric of the Israeli government, while an almost deafening silence emanates from Palestine. I understand the news blockade is in place. There is very little direct coverage coming from inside Gaza, but this does not preclude the likes of the BBC, an organisation that should represent the best of unbiased and brave reporting, funded by the very inhabitants of this country, from presenting any argument whatsoever, but it is as good as this. The story should be the growing humanitarian crisis, the vastly disproportionate response to Hamas’ almost symbolic rocket attacks, the almost complete cessation of aid traffic to Gaza in the last 18 months, and particularly the last few weeks, that has left the 1.5 million inhabitants near starvation, without medical care, food, water, electricity or help. There are not 1.5 million Hamas fighters there, but yet we continue to treat them all as such. It depresses and angers me that such a biased picture can be presented as ‘news’. It’s almost astounding that the likes of President Bush’s (in his last days as the lamest of ducks) weekly address, that lambasts Hamas and supports Israel in such a blinkered way that it is almost comical if it weren’t disgraceful, can be broadcast with no comment, no counterpoint. If this coverage continues then it is nothing better than propaganda, and for this the BBC should be held to account and ashamed of itself. I’ve never felt the need to contact the BBC in the past like this, but this is beyond reproach. It’s a conflict that in any other location would be ethnic cleansing, genocide, yet here, in the UK, we’re saturated with reports that present an almost completely one-sided picture, and it’s one for which an organisation such as yourselves should be both rightly criticised, and completely ashamed. This has formed part of the decision to go to protest this week at the Israeli embassy. It feels like the least we can do. It doesn’t take much to see the almost minute-by-minute news from the Israeli-Palestinian conflict on our screens, airwaves, webpages this last few weeks. The fact it’s been going on for months, and in fact decades, is less reported or covered. Like with many things in our fractured planet at the moment, the emphasis is on the NOW. And now, right now, it’s a conflict that would only appear to have one side. Hamas, are the bad guys. And that is why this ‘war’ (though with the Palestinians so outnumbered and outgunned, invasion would be more appropriate) is so much an example of how this 2000s planet earth functions. Hamas are a terrorist group, according to the UK, US, Canada and EU. To their people they are freedom fighters. And since 2006, they are the elected government of Palestine. But, if you believe the media, specifically, the BBC, Sky, ITV, CNN, Fox, NBC et al, they’re the stone-throwing, rocket-launching terrorist instigators of this entire shameful and saddening conflict. Let’s forget the almost laughably disproportionate level of attack (100s of rockets from Hamas, single figure deaths – some figures from their own troops on Israel’s side – to 10 days of aerial and now ground bombardment, 600+ dead, 1000s injured, and lack of electricity, water, food, aid and medicine) and remember that whatever happens, Israel is acting in self-defence. Let’s enjoy the news ‘blackout’ (just because you are in Israel doesn’t mean you can’t report on Palestine) that means in the UK we only see Israeli politicians and soldiers giving their ‘balanced’ accounts of the conflict (though Channel 4 must be lauded for their egalitarian stance alone from all other broadcasters here). After all, if we are fed enough of this ‘truth’ then perhaps we will one day believe it. As far as i can see it Isreal keep saying they will stop any offensive as soon as Hamas stop firing rockets into their country. All Hamas seem to be bothered about is telling Isreal they will be crushed and killed in Gaza and have no intention whatsoever of stopping the firing of rockets. The only way anything can get sorted out now is by Hamas giving up. As soon as they do all this will end and the world can then look at sorting whatever issues palestinians have in Gaza. 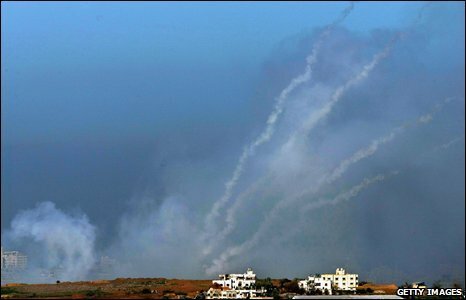 Do you agree that the response from Israel to Hamas’ rocket attacks (which have killed only a few people) is completely disproportionate? Do you agree with the blockade of Gaza over the last 18 months by Israel to prevent fuel, money, water, food, medical supplies and general aid (currently less than 10% of the amount needed each day gets through, if at all) thus starving the Palestinian people? Hamas, while I agree are a terrorist/military organisation as well as (people do sometimes seem to forget) an elected government, are defending the right of the Palestinian people to live in their own country. Did you not see the map Tony posted showing how Palestine has been encroached upon by Israel in the last 60 years? Would you agree with England being gradually eroded to less than 10% of its size by another country? Israel are happy to use Hamas’ rockets as the excuse to totally destroy Gaza’s infrastructure. While they claim they are destorying Hamas’ system of government (they see a return to the Palestinian Authority that Hamas beat in the elections as a solution) what on earth do they think will happen when there’s a ceasefire? Gaza is being systematically pounded into the ground. Once there’s a ceasefire, Israelis will be going about their daily business while 1.5m Palestinians starve. There’ll be no country left to govern by the time this is finshed. When this was Bosnia, we called it genocide or ethnic cleansing. What’s the difference here? This was a person not ignorant or blinkered, just representative of the general population, taking their views of what is fed to them in the media. It’s depressing that we are led so much by those channels, some of which do have agendas, but some of which, like the BBC are publicly funded and are bound by their charter to be ‘impartial’. They should have it challenged, even more so than during the Iraq war. Today’s blast at the UN-controlled school was particularly shocking – remember that the UN give the Israelis GPS coordinates of all their schools/safe houses so they no where they are and they don’t target them, yet they hit 3 today, one of which resulted in 40 deaths. Israel were on the news almost as soon as it happened claiming that they were only acting in self-defence, and that the explosions “didn’t relate to the ordanance we used” (ie. that Hamas’ had their own explosives in there – a UN safe area – which caused the deaths). That’s what gets to me the most. The total lack of balance, (Channel 4 is the only one really providing this) and then the almost complete lack of opposition anywhere within the Arab world, UK, Europe (bar France). The UN is therefore appearing weak and powerless. Another blog echoes this desperate situation perfectly. We can only hope the ceasefire talks and news of a humanitarian corridor are valid and that we shall see an end to the bloodshed. This is genocide by any other name.